Dr. Mamdouh El Damaty, Minister of Antiquities during the press conference said "Nicholas Reeves paper can not be ignored. He is the author of "The complete Tutankhamun". I spoke to him on the phone and he will be coming to Egypt during the second half of September to discuss his clues on his "discovery". I agree with Nicholas Reeves that there could be something there behind the walls of King TutAnkhAmon's tomb. Maybe a room or a tomb .... Something there which will be a new addition to Egyptology but I don't agree that much with him that it is Nefertiti's tomb there. He believes it is Nefertiti, of course I hope so but it could be a tomb for someone else. Anyway, it will be an important discovery and it will add new information and revels new secrets of the golden pharaoh's tomb which grabbed the world attention since it was discovered in 1922." 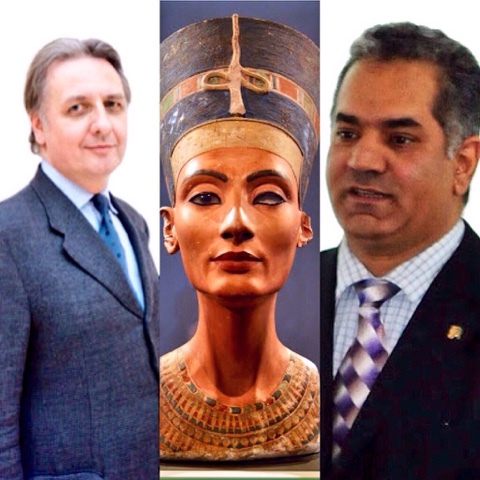 As for what the ministry would do regarding technical issues such as using suitable equipments to check behind King Tut's tomb walls, Dr Mamdouh El Damaty said "We will use the latest radars and if proved there are spaces behind the walls then we will study the best way to get through without damage." Dr. Mamdouh El Damaty, Minister of Antiquities during the press conference says "I agree with Nicholas Reeves."